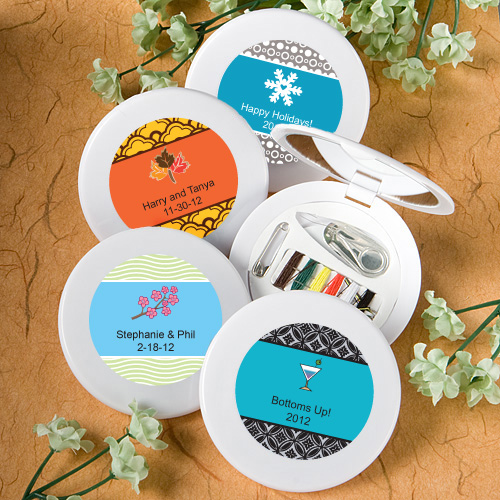 Give sewing kit favors to your bridal or baby shower guests and they will thank you the next time that they have a clothing emergency. Each compact kit measures 2.75" round with hinges and has a white plastic exterior and a handy glass mirror and sewing kit - complete with two needles, a threader, two spare buttons and a variety of threads - tucked inside. The compact's outer center is fit for easy application of the personalized label of your choice. nice and compact to take anywhere.